I believe this is because many laptops slow the clockspeed down of the processor when at low battery. invol wrote: (Mac) and use the arrow keys to move the selection to different areas of interface - e.g., Track to Browser to Track View, etc.. If you're trying to sync up songs in a DJ set that haven't been properly warped (either by you because you were lazy or by lives auto function), each audio file has its own little slow down or speed up buttons to sync them up! If you map them to a controller the functions will just control whatever audio file you have on screen! DELETE UNUSED SCENES IN SESSION VIEW. DELETE UNUSED SCENES IN @&$!# SESSION VIEW! i learned this one the hard way, losing god knows how many hours of my life the past 5 years, maybe more I can't even remember. 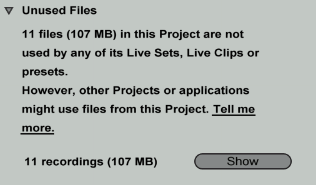 essentially, when I created my first Live template MANY years ago, I thought I was super cool with my badass 16gigs of RAM Quad-Core Multi-Hardrive blah blah blah production rig; and I set up a Live template that had HUNDREDS of unused scenes in Session view, just sitting there. I used that template and it's variations for years, all the while with the empty scenes just sitting there, slowing down my projects. I would get to mixdown phase or the end of tracking (most 60+ tracks, a few songs 100+) with all my tracks frozen or rendered wondering why it took so goddamn long to open a Live Set, Close a Live set, delete tracks, insert tracks, move tracks, group tracks etc.. As a matter of fact before I deleted the 600+ (don't ask) scenes in Session view, I don't think I ever waited for Live to close. I just got used to the crash screen every time I closed and opened a project. My Session view at tracking now? 15-20 Scenes tops. Mixdowns: 1 Scene. Not obscure but a lot of people here probably want to know Ableton Live inside out. There's a new Ableton Live 9 course up on YouTube. It shows how to use every function of Live while building a track from scratch. Includes some free sample packs and the completed Ableton Live project file too. Thanks Tarekith. I'm posting a link to a free tutorial series on YouTube. I'm not asking for money from anyone. I'm sharing free information. If you think that's lame that's your opinion and cool with me. Hope you're well. Been a while since I interviewed you. Last edited by Xenflex on Sat Sep 02, 2017 12:38 am, edited 1 time in total. it's lame because the thread is about people sharing obscure knowledge. and your passive-aggressive response is pretty lame too. To record automation without deleting a clip's contents (and without needing to record from session view to arrangement view) - un-arm the track you want to record the automation into and then hit the record button. Actually a very insightful aspect of overdubbing, that is easily overlooked. I didn't remember it now, so had to check. Great one! not sure if obscure, or just underused ... tidy up unused files and claim drive space. when you have projects like mine with hundreds of als versions saved in the project you can leave big orphaned recordings behind, stuff you tried out way back in mynewsong-012.als and then deleted from the session - but it's still in the project/recorded folder taking up drive space. File->manage files, (manage Project) and Live will scan the project folder for all the files used in all the .als sets. Under "unused files" choose show - and see a bunch of stuff you thought you had thrown away, but it's simply lurking, taking up space. Delete those files, they are unused in this project. All cells of a drum rack apparently internally register as C3. Don't know if that is common knowledge or not but just figured it out while doing some work in Max for Live. That's because simpler defaults to a root note of C3, and it's less hassle to leave it that way for unpitched samples like drums. You can change it in the chains by opening the I/O button if you want a different note.